A Combined Maritime Forces (CMF) frigate intercepted two drug-smuggling skiffs during a routine patrol on Friday, destroying $7.6 million worth of cannabis resin. Royal Navy warship HMS Northumberland located the smugglers as they attempted to cross the Gulf of Oman, 130 miles north-east of Muscat. Her Merlin helicopter, in the air on a surface surveillance flight, identified two fast-moving radar contacts and went to investigate. The moment the skiffs were identified Northumberland set off on a 30-mile pursuit, finally intercepting the smugglers with her helicopter and boarding team. 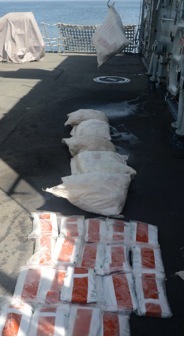 During the chase an estimated 60 bales – approximately 1500kgs – of drugs were thrown overboard by the smugglers. Seven of these were subsequently recovered by Northumberland’s crew, and found to contain pure cannabis resin. HMS Northumberland operates under the command of Combined Task Force 150, one of three task forces co-ordinated by CMF. 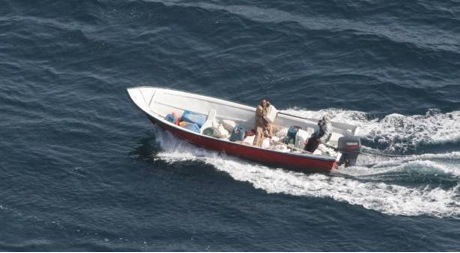 The Task Force is operating in the Gulf of Oman to prevent piracy, defeat terrorism, stop illegal drug trafficking and promote the maritime environment as a safe place for mariners with legitimate business. Commodore Simon Ancona, RN, Deputy Commander of CMF, said: “This is why we’re out here – to stop people and organisations from making money through the illegal drugs trade. The CMF’s Director of Operations, Captain Robert Slaven, RAN, praised the quick reactions of the crew.